Back in Febuary i was in London for a couple of days with my Mum. 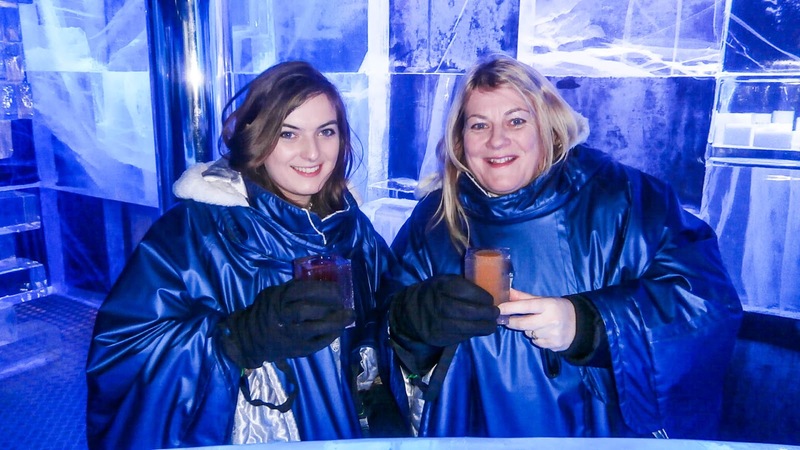 I’d planned to go to the Ice Bar last Septemeber but unfortunately it was getting renovated so i thought it would be a really unique experience to take Mum along. We had to book in advance online as you wasn’t allowed to just show up, It wasn’t too busy when we arrived around 9pm but it soon filled up. The ICE Bar is located just off Regent Street in a little cul-de-sac with a few bars and eateries in the area. Once we confirmed our attendance we got big snow suit ponchos with attachable gloves thrown on us and we had to enter through some electric doors. I think we paid around £13 each to go in and this included a little cocktail and a 45 minute session although as it wasn’t that busy, the staff wasn’t too bothered about how long we stayed. We chose our cocktails which were yummy and sat at an ice table. I know it’s an Ice bar but literally EVERYTHING is made of ice. It was an amazing experience and i would go back but I know it’s an obvious thing to say, It really was freezing in there. I don’t think i could be in there for more than an hour as i couldn’t move my fingers and toes and i had my own gloves on as well as the ones provided. I would definatly consider going back as it was a really great experience but I’m not sure I would be able to handle the Ice Hotel! If you are looking for some other delicious restaurant reviews, check out my Food Directory. I'll try to remember to re-read this post and be envious in August when it's oppressively hot here. A visit to the ICE Bar would be a real treat then! Are all the beverages cold or do they serve anything like hot chocolate or tea? What a fascinating experience! Oooo this has been on my to-do list for a little while but haven't got round to it yet. I am in London in June though, so may look to book for then. It looks great fun and an experience to try at least once. This is so cute! I've always wanted to go to one of those, looks like so much fun!